It has been quite a while since I have participated in the weekly challenge over at i ♥ faces. I really just haven't had the time to think about it with the craziness of summer and the start of the new school year. However, when I happened to see this weeks theme "contemplative" I immediatley knew I had to enter. During our recent beach trip I captured this image of Ella making her first encounter with the ocean. She ran for the water but once she saw the surf moving towards her she hesitated. I love how this image shows her cautiously "testing the waters" with her toes. How cute is that?! To enter your own photo or to see more "contemplative" images head on over to i ♥ faces. Oh My! She is so stinkin' cute! Love that little bikini. That is so cute...I love it! What an adorable picture!!! 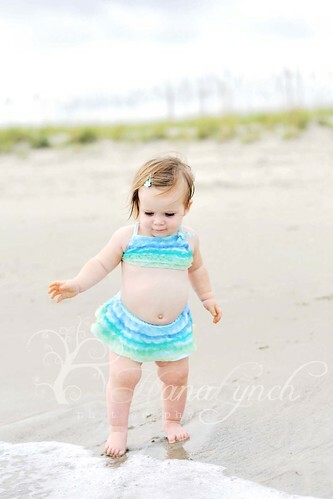 ;) She is a total sweeting and what a great swim suit..if only I would look that cute in it! Glad you decided to enter!!! Good Luck this week! I love all of your pictures! God has blessed you with such a gift. Thanks for the blog love, and I definitely agree with wanting a calf! It was so cute! She's just too beautiful! Oh goodness, what a little doll. Lovin' the Gymbo bikini she's wearing. My name is Suzanne and I'm looking to identify influential bloggers that may be interested in working on a great opportunity together with CSNBaby.com. I love your site and would love to put together a giveaway or guest post using our collection of furniture and accessories that will spruce up anyone’s home! Thank you for your time and I look forward to continuing our conversation if you are interested in learning more! It's so fun to watch children seeing and experiencing things for the first time. He, he... look at those little rolls! Great color,Hana. What a sweet picture! I love this! You are such a great photographer!